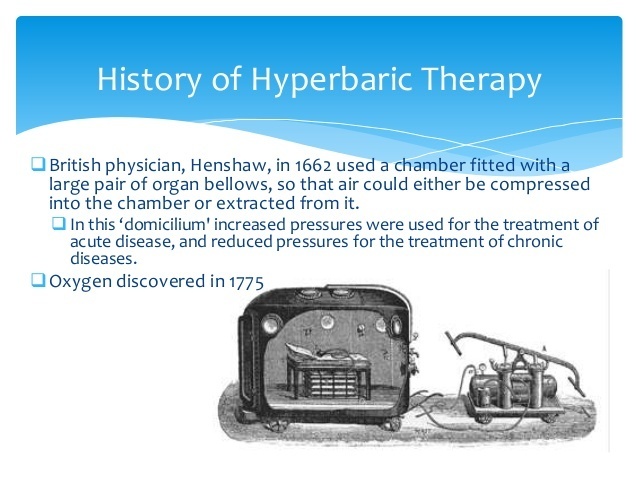 Hyperbaric chambers have been in use for centuries, as early as 1662. However, hyperbaric oxygen therapy has only been used clinically since the mid 1800's. In the 1850’s men excavating tunnels under the caissons (for placement bridge piers) in rivers in New York and London suffered from the severe joint pains, which they called the “bends”. It was observed that the length of exposure to increased air pressure and the workers speed of ascent, correlated with development of illness after surfacing. Compression chambers used to control reduction of pressure and treat illness. Hyperbaric oxygen therapy was tested and developed by the U.S. Military after World War I, and it has been used regularly since the 1930's to help treat deep-sea divers with decompression sickness. Clinical trials in the 1950's uncovered a number of beneficial mechanisms from exposure to hyperbaric oxygen. These early trials, were the forerunners of contemporary applications of hyperbaric oxygen in the clinical setting. Today there are a number of increasing indications, approved by the health authorities, as primary or adjunctive treatment modalities. Hyperbaric oxygen treatment has proved to be a life and limb saving treatment as well as cost effective. It is therapeutic in a variety of clinical conditions. In 1992, a purpose-built unit was opened on the site of the original container behind Douglas Fire Station and operated by the Kevin Gray Memorial Charity. There were two multiplace chambers with equipment for the provision of emergency care conditions, utilising mixed gases and saturation treatments until June 2018. In 2019 a charity called HBOT IOM has been formed by a dedicated team of people to ensure that Hyperbaric Oxygen Therapy returns to the Island in 2019/2020. This charity is also to be the operators of the facility and have taken over from Kevin Gray Memorial Charity. In order to get the facility back open as quickly as possible an enormous task will be to raise funding to purchase, install and commission a brand new chamber into the current facility and the removal of 2 original chambers now over 50 years old. Three years ago through public donations the “Friends of the Hyperbaric Chamber” purchased a second hand chamber which is still in the UK which has not been used. This will also be sold and greatly assist in the finances towards the new chamber. The Isle of Man is in a unique strategically important location within the Irish Sea with our fabulous Manx clear waters and that is not going to change unless someone lets the plug out. What will change is that the amount of commercial and leisure diving activities will continue to increase along with the risk of an accident happening that requires our services. HENCE THE IMPORTANCE OF GETTING THE FACILITY BACK UP AND RUNNING TO POTENTIALLY SAVE A LIFE AND IMPROVE THE PAIN AND SUFFERING OF MANY OTHERS.